Snrky: When they said we'd be pair programming again, this is not what I had in mind. When they said we'd be pair programming again, this is not what I had in mind. Complaining about interns, is par for the course, but having started my software development career as one I tend to cut them a little slack. 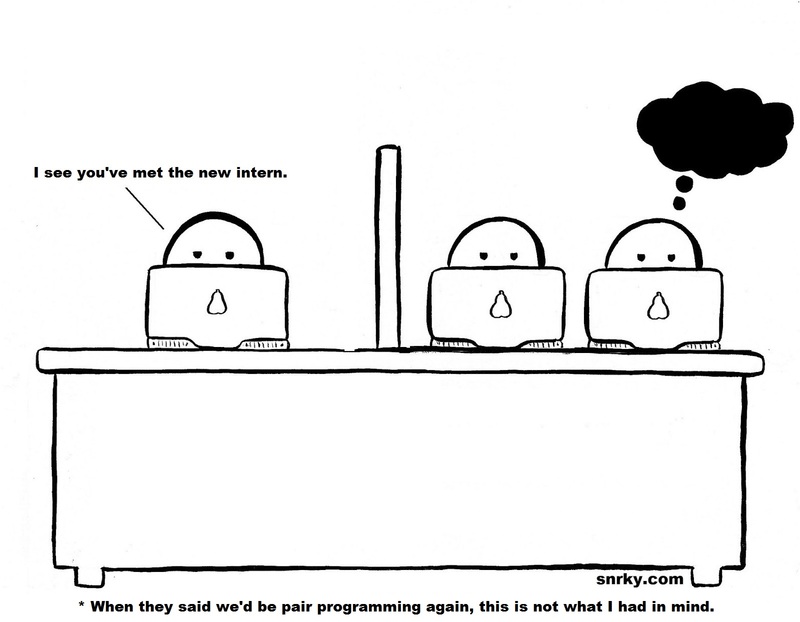 Obviously there are plenty of big intern-induced %&$!-ups, but in the world of corporate software development where the separation of concerns generally includes actual teams of developers it is pretty hard for an intern to cause a lot of damage if their well-intentioned code blows up. And even if it does my experience tells me the presumption of fault is on the supervisor, not the intern. Title: I see you've met the new intern. Snarky: When they said we'd be pair programming again, this is not what I had in mind.